Meet Graham. He's not built like you or me. He's got a head shaped like a termite mound, a chest like a battering ram and feet like gnarled tree roots. He isn't easy on the eye. But to survive on the roads, you'd need to look something like him. Or at least, that's how the Transport Accident Commission puts it. Graham is the TAC's latest creation in a long-running campaign to promote safer driving and reduce death and trauma on the roads. He's graphic, but nothing like past graphic campaigns about horror car crashes. His deformed body is an attempt to illustrate how ill-equipped the human body is to withstand the force of a car crash. Graham was built by Patricia Piccinini, an internationally celebrated Australian sculptor whose most famous works include Skywhale and Protein Lattice. 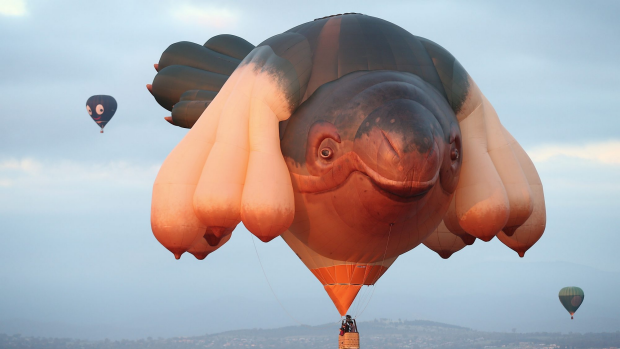 Skywhale flies over Canberra. Photo: Alex Ellinghausen Piccinini was briefed by Monash University Accident Research Centre crash investigator David Logan and Royal Melbourne Hospital trauma surgeon Christian Kenfield, about what bodily features a human would need to avoid serious injury in a car crash. TAC chief executive officer Joe Calafiore said the sculpture was meant to remind people of their vulnerability on the road. "People can survive running at full pace into a wall but when you're talking about collisions involving vehicles, the speeds are faster, the forces are greater and the chances of survival are much slimmer," Mr Calafiore said. "Cars have evolved a lot faster than humans, and Graham helps us understand why we need to improve every aspect of our roads system to protect ourselves from our own mistakes." Graham will be on display at the State Library until August 8. People will be able to use Google Tango, a new augmented reality app, to look beneath his skin and see how his unique features would cushion him from serious injury in a crash. The TAC's latest campaign comes at a time when efforts to reduce road deaths have stalled. Australia's road toll has risen almost 10 per cent in the past year, according to figures from the Bureau of Infrastructure, Transport and Regional Economics. In the 12 months to June, 1269 people died on Australia's roads – 99 more deaths than in the same period in 2014-15. In Victoria, 151 people died between January and June, a 15.3 per cent increase on last year's tally. He's not built like you or me. He's got a head shaped like a termite mound, a chest like a battering ram and feet like gnarled tree roots. He isn't easy on the eye. But to survive on the roads, you'd need to look something like him. Or at least, that's how the Transport Accident Commission puts it. Graham is the TAC's latest creation in a long-running campaign to promote safer driving and reduce death and trauma on the roads. He's graphic, but nothing like past graphic campaigns about horror car crashes. His deformed body is an attempt to illustrate how ill-equipped the human body is to withstand the force of a car crash. Graham was built by Patricia Piccinini, an internationally celebrated Australian sculptor whose most famous works include Skywhale and Protein Lattice. Piccinini was briefed by Monash University Accident Research Centre crash investigator David Logan and Royal Melbourne Hospital trauma surgeon Christian Kenfield, about what bodily features a human would need to avoid serious injury in a car crash. TAC chief executive officer Joe Calafiore said the sculpture was meant to remind people of their vulnerability on the road. "People can survive running at full pace into a wall but when you're talking about collisions involving vehicles, the speeds are faster, the forces are greater and the chances of survival are much slimmer," Mr Calafiore said. "Cars have evolved a lot faster than humans, and Graham helps us understand why we need to improve every aspect of our roads system to protect ourselves from our own mistakes." Graham will be on display at the State Library until August 8. People will be able to use Google Tango, a new augmented reality app, to look beneath his skin and see how his unique features would cushion him from serious injury in a crash. The TAC's latest campaign comes at a time when efforts to reduce road deaths have stalled. Australia's road toll has risen almost 10 per cent in the past year, according to figures from the Bureau of Infrastructure, Transport and Regional Economics. In the 12 months to June, 1269 people died on Australia's roads – 99 more deaths than in the same period in 2014-15. In Victoria, 151 people died between January and June, a 15.3 per cent increase on last year's tally. This story Meet Graham, the TAC's new weapon in the fight against death on the road first appeared on The Sydney Morning Herald.